Hey friends! I am so excited for the launch of my social media tips class this afternoon. There is just so much to talk about and share with everyone. Today I am extending the first session over onto A Tiny Traveler because I feel like everyone can benefit from investing in their social media with how prevalent it is today. Whether you're a writer, artist, run a business, lead a ministry, or you're a blogger social media can be very beneficial. It helps you spread your message, product, and heart with a community of people who are interested in what you have to offer, so its important to take some time and invest in it. 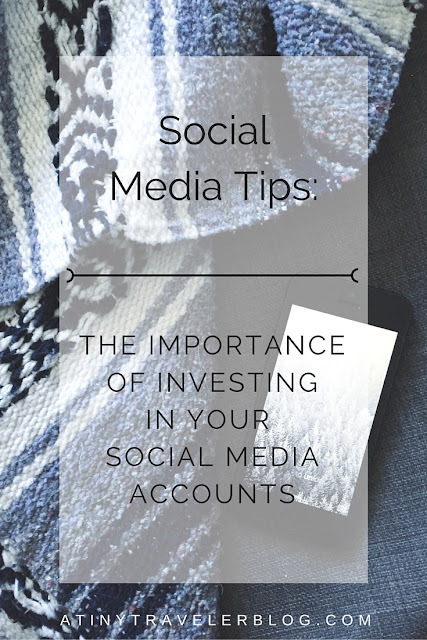 Here are a few tips on ways that you can invest in your social media accounts such as Twitter, Instagram, Facebook pages, and Pinterest. When you invest in something you care about, the results really show. The same can be said of what you post online! When you take time to think about what you post and when you'll start to see results. + Think before you post. Is it positive? Is it going to help a cause or spread a message? Is it true to who you are? If you're a funny person then posting jokes or silly photos depicts your personality. If you're a creative person, then retweeting a link to a new museum exhibit or posting a picture of your latest masterpiece says what you're about. If you're having a bad day however, posting something angry or negative might not be the best idea. It doesn't better you or anyone else and can even hurt your reputation or make a situation worse. Trust me, I've done it and it doesn't help anything. + Use quality images. When you're posting images, make sure they are clear and bright. It's hard to stay interested in an account when the photos are blurry, dark, or hard to understand. In addition, moderation is key. For Instagram, posting 1-3 quality images a day is probably the most you should be posting, unless you're one of those accounts that has thousands of followers and gets crazy good feedback, otherwise keep the cat photos to a minimum. On twitter, you can have 4 photos in one post at a time so this is a little more lenient. If you took a trip recently, you can post highlights to twitter, one or two on Instagram, and the rest of the images to Facebook! If you're making a graphic or advertisement make sure that it has adequate information, without being too wordy. In addition, make sure it is cohesive with your style and interests! + Hashtags. What exactly is a hashtag you might be wondering? Well, it is a word that you write after the pound sign to describe the image or statement you're making. (That is the most literal definition I could think of) On social media, you can use them to categorize your images, so when you click on the hashtag you can find other similar images and users that have the same interests! When it comes to hashtags, you should think about it a little before you add them. Don't overdo it. 25 hashtags would probably count as overdoing it. Also, try to make sure they are relevant to your image. I'll be the first to admit that there are a handful of hashtags I usually stick to like #livefolk and #thatsdarling as well as the seasonal hashtags that Betsy Fick and I created (currently it is #itsabeautifulwinter). As the social media class continues I'll be doing an entire section on popular hashtags. + Engagement. When someone comments or replies to one of your posts, be sure to respond! There is nothing more important as your audience grows than to be kind, be yourself, and be responsive. How can a community grow if no one is talking, complimenting, or questioning anything? Get out there and start telling people when you like their photos or ask questions. If you have a cool planner or pretty clothes, I'm going to ask where they're from! Why not? Get to talking and become friends! + How many times did you post today? Sometimes you need to make sure that you're posting the appropriate number of times on certain platforms. Each platform gleans different results. Below you can see the specifics to each platform. Twitter is fast paced and new information is constantly being posted. Because of this, you can share more often than on other platforms. You can get away with quantity over quality on Instagram, but that is the importance of investing, because why not do both? Post a lot of good posts! There is a balance to it however, because you don't want it to be fake or overstyled. So find a balance with quantity and quality. As far as posts go, 3x a week is a good minimum and no more than 10x. On Facebook however, you want your posts to be made up of quality images, quotes, or description. Quality over quantity for this platform. Unfortunately, Facebook pages don't always display your posts in the newsfeed of those that like the page. When we reach the Facebook week for my social media class we'll talk more on boosting posts and advertising and if it is actually worth it. As an image based platform, you need to make sure these posts are quality. As of November 2015, IG is caption sensitive so you need to make sure that you keep cations short to get it all in one visual, otherwise viewers need to click on the image to see more. Usually the best photos come from ones taken with a DSLR and then uploaded onto your mobile. When you're just casually posting images for your blog, business, or lifestyle then you can keep it to 1-3 posts a day. As a business or ministry account when you're posting for an event such as a retreat or concert you can probably post a little more (maybe 4-5 posts) but you don't have to. Try to gauge your audience and how they respond to multiple posts and go from there. You don't want people to get annoyed with you (if we're being completely honest). From what I've realized, posting your own content and repinning content that you're interested in/interests your audience will keep things cohesive and reaching more people. When you post your own content, try to make your own graphics that are suited best for Pinterest. Most of the best Pinterest graphics are 730 x 1100 pixels. For a board thumbnail you should use 222 x 150. So there you have it folks, a few extra tips on investing in your social media! Be sure to be honest, intentional, and engaging and you'll see a more connected and authentic audience. Plus, it'll start to get really fun! *Social media platforms tend to change every year, so in order to stay up to date on photo sizes, hashtags, and engagement always do your research!